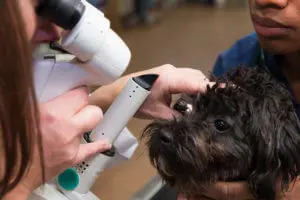 Our 24 hour pet hospital is located in Levittown in Bucks County and serves greater Philadelphia, the Delaware Valley, Trenton and nearby communities. When you have a pet emergency, seconds count. We want you to know, our 24-hour vets are ready. If your pet has a condition that requires a specialist’s expertise, we’re ready for that too. 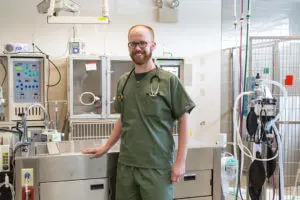 Our veterinarians, vet technicians and support staff work closely together to provide the comprehensive, compassionate care your pet needs and deserves. Emergency: In an emergency, call ahead to your VSEC vet and let us know you’re coming. No appointment is necessary for our emergency vet. Learn more about your emergency visit. Our Levittown hospital opened in 2011 and is open 24 hours a day. The state-of-the-art hospital features a CT scanner, MRI machine, an intensive care unit, separate canineand feline wards and more. We also offer radioiodine I-131 treatment for cats with hyperthyroidism. We frequently share our medical expertise by inviting primary care veterinarians to educational events at our hospital. Our Levittown hospital has been named a National Trauma Center, which puts it in an elite group of veterinary hospitals. And in 2017, VSEC was named “Practice of the Year” in a nationwide competition. We are part of the BluePearl network of veterinary specialty and emergency hospitals.